Iran hearings: The congressional grilling of John Kerry and Ernest Moniz shows how unfit to lead the GOP is. The Iran hearings have shown how the Republican Party can no longer be trusted with the presidency. Sens. 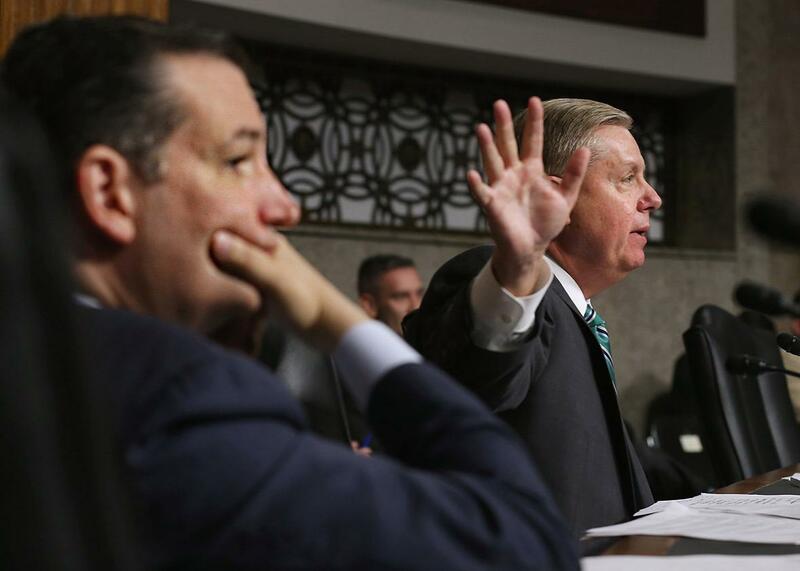 Ted Cruz and Lindsey Graham question witnesses during a hearing about the Iran nuclear deal on July 29, 2015, in Washington, D.C. If you didn’t have time to watch the 11 hours of hearings conducted on July 23, July 28, and July 29, consider yourself lucky. Here are the lowlights of what you missed. 2. Israel. As evidence that the Iran deal is bad, Republicans point to criticism from Israel. But they seem more interested in the rhetoric of Israeli politicians than in the judgments of Israeli security experts. At the July 23 hearing, Kerry read from an article that quoted supportive statements about the deal from the former leaders of two Israeli intelligence agencies. Republicans batted the quotes away. Sen. John Barrasso of Wyoming scoffed, “That wasn’t even in the newspaper. That was a blog post.” Sen. Lindsey Graham of South Carolina dismissed the statements as irrelevant because they didn’t come from elected officials. Why listen to experts when you can rely instead on quotes from politicians? Inhofe: Secretary Rice [sic] said she has seen the deal with the IAEA. … Did you see it at the same time, or prior to the time, that Secretary Rice saw it? Kerry: Senator, National Security Adviser Rice has not seen it. Kerry: No. She has been briefed on it. I had—I gave her exact quote to Congressman Poe. … She has been briefed on it but has not actually seen it. Inhofe: Who is quoting her. This is quotation marks. Republicans can be forgiven for misinterpreting Rice’s original statement. But why would they cling to that interpretation after being corrected? And why would they quote their own misinterpretations rather than what Rice said? Cruz: You told the United States Senate you hadn’t read the congressionally mandated commission on EMPs and that you didn’t know what an EMP was. Moniz: That is incorrect. I said I did not know this 2008 report recommendations. I said I was quite familiar with the issue, and we all know about EMPs from airburst nuclear weapons. Moniz: That was about the report. If you read further in the testimony, you will see my explicit statement. Of course I know about the issue. Cruz: Does that mean, yes, it could? Cruz: OK. You’re refusing to answer the question. The most disturbing thing about this exchange isn’t Cruz’s obnoxiousness. It’s his intellectual confidence in the face of his own ignorance. He doesn’t know the slightest fraction of what Moniz knows about EMPs. Either Cruz doesn’t understand this difference between himself and Moniz, or he doesn’t care. He hasn’t even taken the trouble to read the full transcript. And when he’s given a complex scientific answer to a simplistic, politically crafted question, he rejects it. Can any thinking person, after reading this exchange, feel comfortable with Cruz as president? 5. Sanctions. Kerry uses the phrase snapback to describe how sanctions are automatically re-imposed if any permanent member of the U.N. Security Council (the United States, United Kingdom, France, China, or Russia) decides Iran has violated its obligations. At the Wednesday hearing, Sen. Dan Sullivan of Alaska berated Kerry for using this term, since, although the agreement outlines this procedure, it doesn’t literally include the word snapback. Sullivan also argued that the term was misleading because, in originally building the sanctions, it “took years to get countries to divest out of the Iranian economy. It’ll take years to do it again.” But Sullivan ignored the implication of his own argument: As Kerry has said all along, the unhappiness of our allies about having to enforce these sanctions, let alone China and Russia, is why the sanctions won’t last if we reject these countries’ terms for the deal. These Republicans speak as though they don’t understand that the Iran talks involved seven countries. The obtuseness isn’t confined to backbenchers. Corker chairs the Senate Foreign Relations Committee. Rep. Ed Royce, who protested at the Tuesday hearing that the deal gave Russia and China “a say in where inspectors can and cannot go,” chairs the House Foreign Affairs Committee. Do Republicans understand that international sanctions require international support and that when everyone else in the talks finds terms they can agree on, we can’t hold out for our own terms and expect sanctions to persist? Have any of these men heard of Ronald Reagan? The Soviet Union? Red China? Do they understand that bad guys are exactly the sorts of people you end up negotiating with, particularly over nuclear weapons? 8. Indifference. Republicans think it’s weak and softheaded to care what Iran thinks. At the Tuesday hearing, Rep. Scott Perry of Pennsylvania told Kerry we should demand a better deal, “and if the ayatollah doesn’t like it and doesn’t want to negotiate it, oh, ‘boo-hoo.’ We’re here for America.” Weber, speaking for others in his party, ridiculed Kerry’s concerns about Iranian distrust of the U.S.: “Me and my colleagues were up here thinking, ‘Who cares?’ ” When Kerry replied that the Iranians wouldn’t have negotiated on Weber’s terms, the congressman scoffed, “Oh, my heart pains for them.” These lawmakers don’t seem to understand that much of a negotiator’s job consists of understanding, caring about, and accommodating the other side’s concerns. 9. Winning. Graham is running for president as a foreign-policy expert. But three hours of testimony on Wednesday about the difficulties of using military force to stop Iran’s nuclear program taught him nothing. Wrapping up the hearing, Graham demanded that Defense Secretary Ashton Carter answer a simple question: “Who wins the war between us and Iran? Who wins? Do you have any doubt who wins?” When he didn’t get the prompt answer he wanted, Graham thunderously answered the question himself: “We win!” He sounded like a football coach delivering a pep talk. The differences between football and war—what “winning” means, and what it costs—didn’t enter into his equation. Kerry: Sir, I never said the word apology. I never mentioned apologize. I said we should thank them for their extraordinary service. I never said the word apologize. Please, don’t distort my words. Cruz: Secretary Kerry, it is duly noted you don’t apologize to the family members of the service members who were murdered by the Iranian military. Kerry: That’s not what I said, senator. [I said] I thank them for their extraordinary service and I would remind them that the United States of America will never take the sanctions off Qasem Soleimani. Cruz: Sir, I just want to clarity. Do you apologize or not? There’s plenty more I could quote to you. But out of mercy, and in deference to the many dead and retired Republicans who took foreign policy seriously, I’ll stop. This used to be a party that saw America’s leadership of the free world as its highest responsibility. What happened? And why should any of us entrust it with the presidency again?